Guys. Guys. Why is Dissension red all of a sudden? He was promoted and gained the ability to spit fire. I reserve my right to ice breath. And did we guess where Jeff is and his name or is that ongoing? I am finding it a little hard to keep track at the moment. Just to clear this up, no, we aren't trying to guess my name and location at this point. The conversation has turned to that of Diss being a fire-breathing squirrel. And for an unknown amount of time, I'm going to stop with the whole "guess my name and location" thing because Google has decided to combine several of my accounts I have with them and now finding my name (And once you have my name, my location) is something a 5 year old can do. And they currently won't let me change my account to not have my username on it. Also, having ice breath rocks. You never have to worry about drinking a warm soda. I dunno about you guys but I'm gonna try to write a userscript that changes Diss' name back to green because change scares me and green is easier on the eyes. how'd you get such a recent picture of Diss? He follows Diss around and has a very good zoom on his camera. I miss my ice breath. I like the powers that come with acid breath but ice is just much more fitting. At least it in't pickle breath, that would just be silly. A squirrel that can cook itself! Making squirrel gravy just got easier! Mwa ha ha! The problem is that self-cooked squirrel is more likely to burn. Yeah no one is going to like the smell of burnt squirrel hair, trust me. Smells kind of like bacon, tastes kind of like burnt bacon though. Besides. Squirrels don't have that much meat on them anyway. If you can't catch at least two then there is no point. You would never be able to catch Diss anyway. He's too clever. Or the Stinky Cheese Man! I beg to differ. His family can't stay out of my bird feeders. 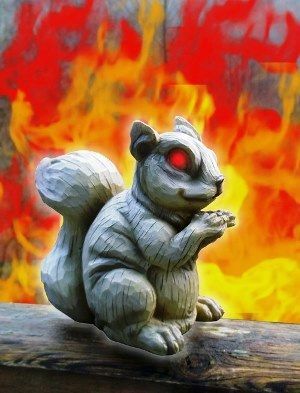 Or if it is radioactive, it could backfire and he could turn into a gaint, hideous monster squirrel that could destroy Tromaville! If I were having a squirrel for dinner I'd make sure it's not poison that I use. Why not just a PBJ&squirrel sandwich ? It'd be more appropriate if it was acorn butter. Hey, Google collaborates with the US government to spy on your everything. Still think Chrome and cloud services are cool? That's disturbing to think about. As ever, politics and controversial topics are not up for discussion. I'm not sure I've ever actually eaten an acorn. Never eaten an acorn? What kind of squirrel are you? Were you raised in the suburbs or something? You read Foxstar, he steals from bird feeders. He's a bad skirrl. Is the red name not enough of a cue, people?